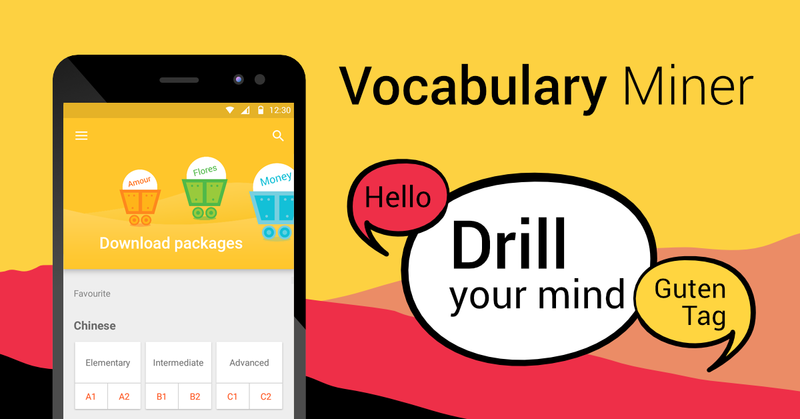 During its first year, the vocabulary-building app Vocabulary Miner created by SKOUMAL studio has helped many students broaden their vocabulary in multiple languages. The new version provides an opportunity to download vocabulary packages on various topics or from some language textbooks. Many users tend to appreciate the practical and intuitive interaction with the app. However, until now, the creation of custom vocabulary cards was required in order to start the learning process. This approach is suitable for rather intermediate students who are interested in a specific vocabulary set. “Now, vocabulary packages are just a click away from students. Moreover, the user can take an active part in creating and sharing vocabulary packages with the community online,” informs Vladislav Skoumal, the founder of SKOUMAL studio. During the trial phase, more than 2000 miscellaneous packages have come to life and new sets are uploaded everyday. “The app is even more user-friendly than before: there are several new ways to sign-in and synchronization across devices is now available” explains Jan Hanzelka, the project coordinator. This year, the new web interface is coming as well in order to facilitate simpler creation of vocabulary packages via computer. The learning method Flashcard System has proved very fruitful so far. It forces users to actively recall words from memory. During the learning process, you decide on how well you memorized a word with a simple touch of the screen. The better you know the words the less frequently you will practice them, and vice versa. Free in the AppStore and Google Play. Currently, we give away Premium with unlimited download of ready-to-use packages for just $1/year. You can add whatever language you want. The app is translated into Czech, English, German, French, Slovak and Spanish.